To appeal a decision from the court of appeals, the appellant must file a Petition for Review requesting a Supreme Court hearing. The Supreme Court judges, known as justices, evaluate the petitions for review and decide whether they will review the case. Unlike the court of appeals, the Supreme Court is not required to hear every appeal. Dec. 9, 1910 The Arizona Constitutional Convention completed Arizona’s Constitution and sent it to the people for ratification. Article VI of the constitution created the judicial system. Feb. 14, 1912 President Taft declared statehood for Arizona. 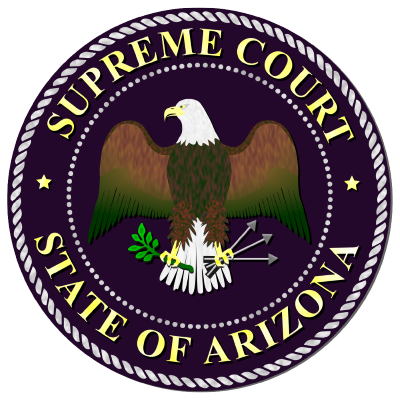 1912 The Arizona Legislature established superior, juvenile and justice of the peace courts. 1913 The Arizona Legislature established police (municipal) courts for each of the state’s incorporated cities and towns. required that Supreme Court justices, court of appeals judges and superior court judges must retire at age 70. 1965 Legislation established the court of appeals. 1970 Voters establish the Commission on Judicial Qualifications (now called Commission on Judicial Conduct). The Commission investigates complaints against any judge in the state. 1974 Voters approve merit selection and retention election of justices for the Supreme Court and judges for the court of appeals. This system also applies to judges for the superior court in counties with 150,000 or more people (at present, Maricopa and Pima Counties). In 1992, voters changed this population cutoff to 250,000, still limiting it to the two most populated counties. The amendment requires the governor to appoint these judges from lists of highly qualified candidates screened and nominated by the Commission on Appellate and Trial Court Appointments. All other counties currently elect their judges, but are authorized to use the merit selection process if approved by a majority of the county voters. 1992 Voters approve Proposition 109, an amendment to the constitution that requires public input and the establishment of a process to review judges’ job performances. Performance reports are distributed to the public prior to each general election. This process includes surveys from jurors, witnesses, litigants, administrative staff and attorneys who have interacted with the judge in a judicial setting. The public provides input through written comment and public hearings. In addition, public committees screen and recommend candidates to the governor for membership on three commissions that nominate judges to fill vacancies on the bench. The number of persons involved in the merit selection process increased from 15 to 109 committee and commission members. One statewide committee with nine non-attorney members serves the Appellate Nominating Commission, and 10 committees of seven members (five for each county) serve Pima County’s and Maricopa County’s Judicial Nominating Commissions.